Now download the XML file and we can start. Edit the just-downlaoded FederationMetadata XML file and copy its content to clipboard. Navigate to the simpleSAMLphp web page https://itdroplets.com/simpleSAMLphp/www, login and click on the Federation tab. 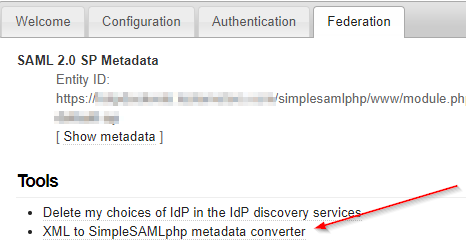 Click on XML to SimpleSAMLphp metadata converter. Paste the content of the XML file you’ve copied on the first step. We’re only interested in saml20-idp-remote since we’re not going to use simpleSAMLphp as an indentity provider. Copy the content of saml20-idp-remote to clipboard. 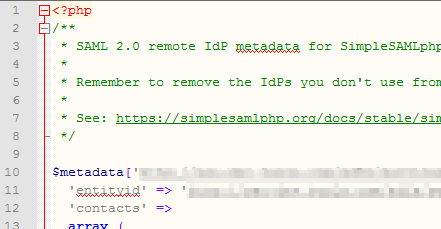 Edit C:\inetpub\wwwroot\simpleSAMLphp\metadata\saml20-idp-remote.php and paste the content copied above in there. 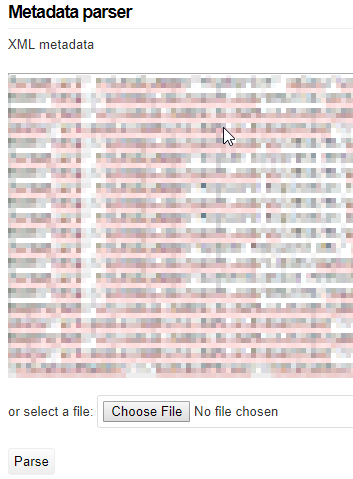 Note, that PHP file doesn’t have a PHP end tag (?>), keep it that way, so just copy it right under the commented text.